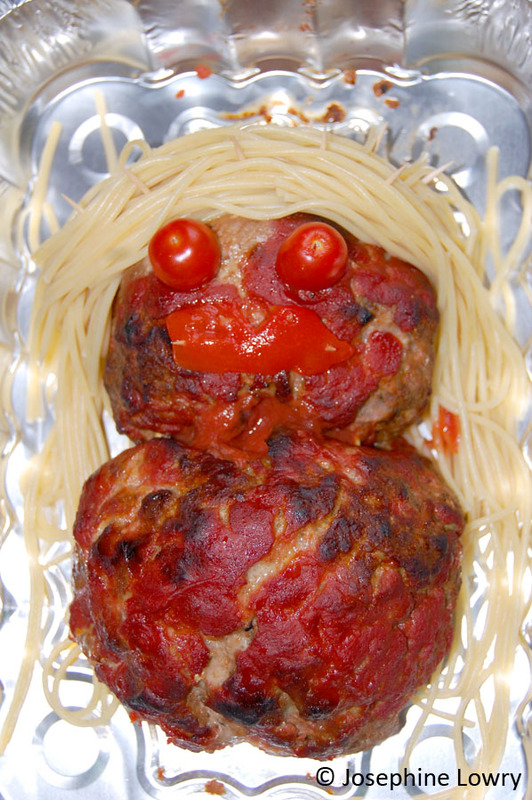 Considering the recent spate of cannibalism in the news, it’s the perfect time for a post about creating replicas of friends, enemies, and memes in meatloaf. And, as we learned in the Meat Cake post, meatloaf is a highly versatile medium. It’s also yummy. 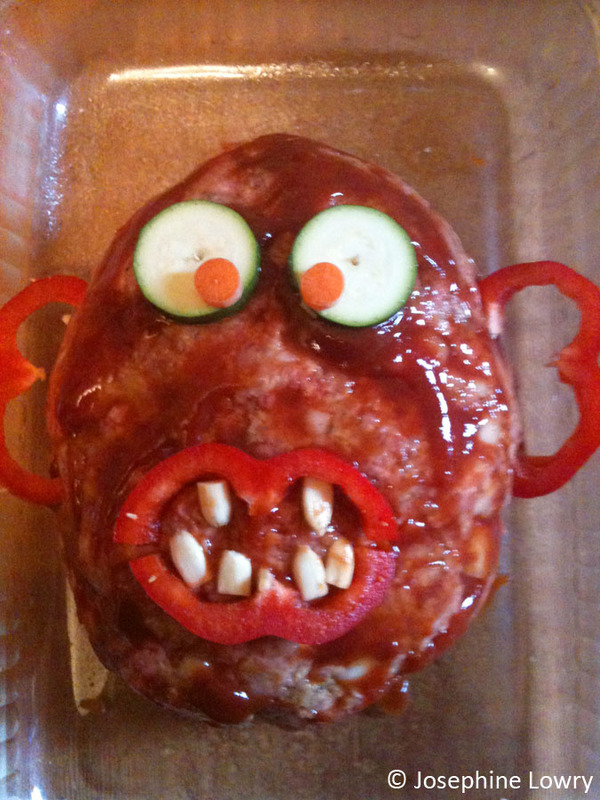 An invitation to a friend’s birthday was the inspiration for my first creation: Meatloaf Jeff. Many, many years ago, I rented a room in my friend Jeff’s house and he used to stand outside my door, lift up his shirt, scrunch his belly button area, and shake his tummy at me. Oh dear. And yet, I still cherish Jeff and those random moments of friendship. To make Meatloaf Jeff, I made a batch of meatloaf and formed a large-ish oval and a small-ish round mound. These would become the head and body. I connected the two using some broken-in-half bamboo kabob sticks. For eyes, I used cherry tomatoes (held on with toothpicks) and for his mouth, I tried to carve lips out of a red pepper. Then, I gleefully covered Jeff with ketchup [ed note: in my world, meatloaf is *always* covered in ketchup, never gravy.] Once he was fully cooked, I used boiled spaghetti to represent his long blond hair which I attached to his meatloaf head using toothpicks. His kids loved seeing their dad in meat form, though they squirmed a bit when he cut into himself and served us. On the other end of the spectrum, we’ve all heard that revenge is a dish best served cold. I beg to differ. As a Seahawks fan, I hate the Steelers and I loathe Ben Roethlisberger. So, like any sensible person, I made a replica of his head in meatloaf. Hee! And yes, I know. Grudges are silly. But Superbowl XL and bad calls aside, I still think Roethlisberger is a bad, bad man. And for all the non-Steelers fans, going from Ben Roethlisberger to Old Gregg is a completely logical transition. Who is Old Gregg, you ask? Why he’s a pink tutu-wearing transsexual “scaly manfish” who lives in a cave under a lake and occasionally flashes his luminescent “mangina.” He also loves Bailey’s Irish Cream. In other words: a fabulous subject for meatloaf! As is typically the case, a party was the incentive for creating Meatloaf “Scaly Manfish” Old Gregg. And, now with the experience of meatloafing my friend Jeff and Ben “I’m a bad man” Roethlisberger, I was able to take things up a notch with Old Gregg. I also had some creative collaborative help from Mr. Rock Out with Your Crock Out. Using my standard meatloaf recipe as a base, I added a bit more sausage to the mixture than normal. Why? Maybe I subconsciously was trying to counter-balance the mangina. The head, arms/legs, and body are all separate raw meatloaves that are attached to each other using bamboo sticks. The eyes and lips are onions and beets. Then, the ketchup covering. Once cooked and cooled, we made Old Gregg’s cascading seaweed hair out of non-crispy cooked bacon that was attached via toothpicks. And while I sewed the tutu, Mr Crock used pickled ginger to make some impressively realistic lady bits. Once the lady bits were complete, I added the tutu and voilà! Meatloaf Old Gregg. Of all the friends and enemies and memes that I’ve created out of meatloaf, I must confess that Old Gregg is my favorite. 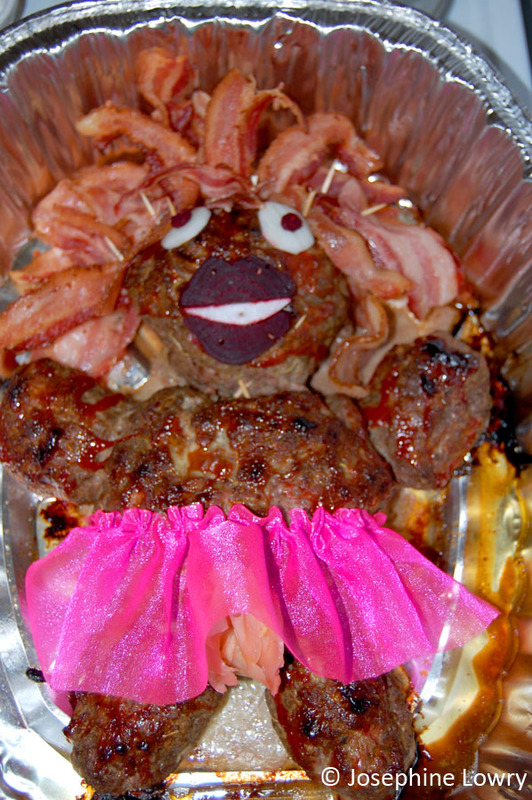 I’m not sure if it’s the bacon, the NSWF pickled ginger lady parts, or the hot pink tutu. 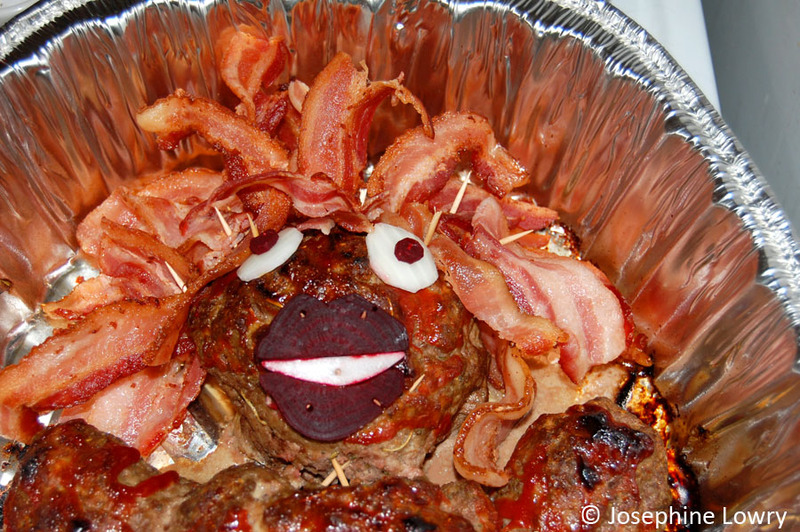 Sadly, this is the only meatloaf art that people have refused to eat. Perhaps we manhandled it a bit too much? I had a moment to check this out. Looks like you are developing a voodoo practice…if I ever watch a Steelers game, I half expect Ben’s chest to burst open and spew forth…ground beef? Or maybe his hands will be coated with bacon strips making it impossible for him to throw another pass ever again until you break the spell, dear lady.. Here comes Old Gregg. He’s a scaly meat-loaf with bacon hair. He don’t know me. He don’t know what I got. Actually, he’s hoping that you’ve got Bailey’s in your shoe. « Jimmy Dean, a Sausage Log Cabin, and a Doh!